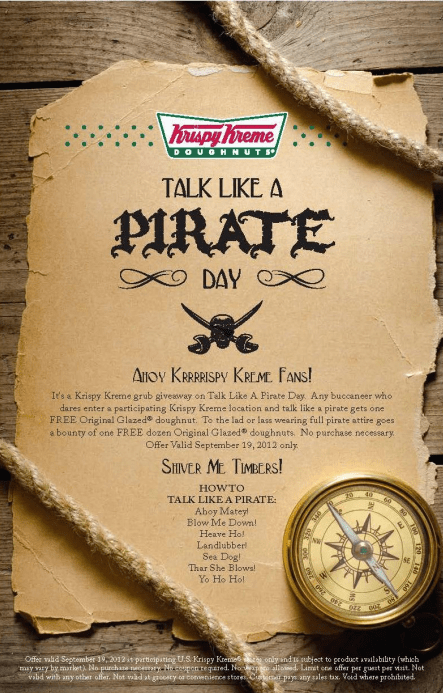 Today be “Talk Like a Pirate Day” and Krispy Kreme’s got a deal for ya that’d knock the knickers off a whore. Show up to one of their land-ships and greet ’em as us pirates do for a free original glazed doughnut. Dress yourself in your best Pirate regalia and get a dozen of ’em–that’s enough to feed your whole crew! See all the details below. And, umm… something about scurvy. Yaaargh.